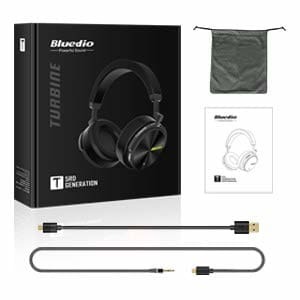 WARM REMIND: Original Bluedio T5 sold by "Bludio". To ensure your consumer rights, please order genuine Bluedio headphones! Any questions about this item, please feel free to let us know, thank you for your purchase! A. Unpair the headphone, remove the pairing memory and then enter the pairing mode and pair again. Please make sure the headset is not more than 10M away from your devices. Reset the headphone: Power on the headphones.Charge the headphones for 10 seconds or so, the headphones would power off on their own(you can see the LED goes out), unplug the cable.Power on the headphones again.And remove the pairing memory of your device,then pair again. The earmuffs are detachable, you can easily remove and reinstall the earmuffs. If you want to fix the earmuffs, we suggest you use glue. 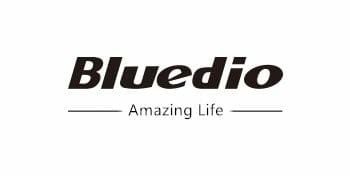 Bluedio is a pioneer in wireless audio with more than a decade of experience in pursuit of excellence. 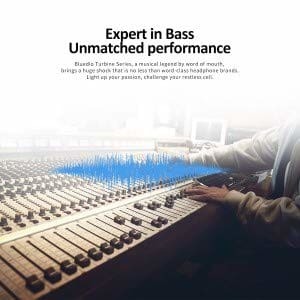 Bluedio has driven the development of innovative electro-acoustic technologies like PPS 8 and PPS 12(Physical Positioning surround sound effect), and in applying them in their world class audio products. With a focus on quality audio products, Bluedio has been expanding and diversifying to more than 150 countries, with a rapidly growing portfolio of more than 30 patents in acoustics. The 5th generation of Turbine shock debut! In order to seek a quiet and comfortable listening environment, T5 uses strengthened 4 Mics immersed Noise cancelling, which can eliminate more external noise.It adopts the all titanized 57mm drive units to strengthen the bass. What’s more, the fully upgraded and optimized chips reduce the power consumption and increase the using time. 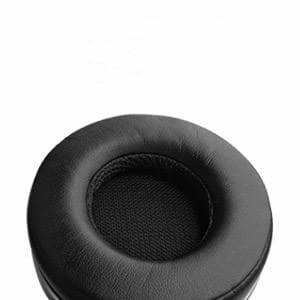 The use of anti-ear-covered earmuffs makes its diameter and front cavity enlarge, skin texture, lightweight comfortable and around-ear fit, which is more convenient and comfortable to to take the headphones outsides with pads flat in your bag, suitcase, trunk, etc. The earmuffs are detachable, you can easily remove and reinstall the earmuffs. T5 continues T4's rotational structure design and CD pattern mirror treatment, and is more sophisticated in color matching. Adopt VFT and 57mm driver to strengthen the bass. 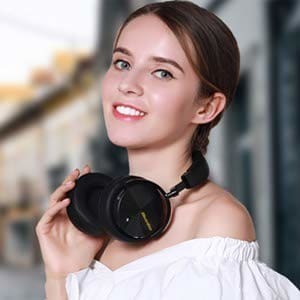 You can enjoy your love music with deep, powerful sound. Bludio T5 with optimized and upgraded the new chip solution decreases Bluetooth power consumption and increases its endurance. 25 Hours playtime per charge at Bluetooth mode. Enjoy your long travel and without worrying about the power shortage problem. Please take off the headphone every 2-3 hrs to get your ears to relax to get better hearing enjoyment and protect the ears. 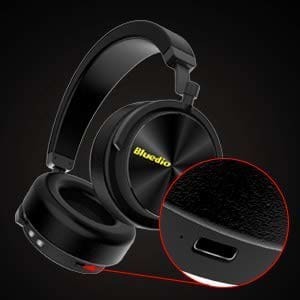 Bludio T5 Bluetooth headset provides a quick and stable connection with your Bluetooth enabled devices like cell phones, tablets, pc, TVs within 33 feet, with a high-quality built-in microphone for hands-free calls. Note: The Microphone only works in the wireless mode. Three in one interface which supports charging and data transmitting. It can be easily plugged in both sides and convenient to use. 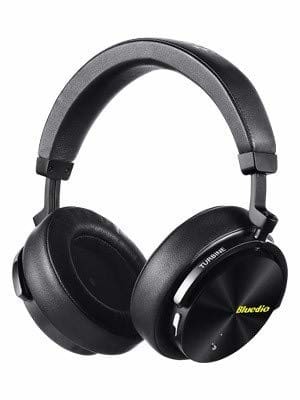 NOTE: Original Bluedio T5 sold by "Bludio".【SOFT ANTI-EAR PADS DESIGN & STYLISH LOOK】A pair of rotating ear cup is comfortable to wear with anti-ear pad design. It is convenient to take the headphones outsides with pads flat in your bag, suitcase, trunk, etc.T5 continues T4's rotational structure design and CD pattern mirror treatment, and is more sophisticated in color matching. WARM REMIND: The earmuffs are detachable, you can easily remove and reinstall the earmuffs. 【 4 MIC ACTIVE NOISE CANCELLING + 57mm PROPRIETARY DRIVERS】Four built-in mini microphones sample and collect the ambient noise spectrum and then send the noise signal to ANC loop for reversal processing. T5 adopts the Active Noise Cancelling technology and bring you crystal-clear sound. T5 Turbine series adopt 57mm Fully Plating Titanium Drive Units, combining with its own developed VFT (Vector Flow Supercharging Technology), which makes the sound steady and impressive. 【BLUETOOTH V4.2 NEW BLUETOOTH CHIP & 25 HOURS BATTERY LIFE】Bludio T5 with optimized and upgraded the new chip solution decreases Bluetooth power consumption and increases its endurance. 25 Hours playtime per charge at Bluetooth mode. Enjoy your long travel and without worrying about the power shortage problem. Please take off the headphone every 2-3 hrs to get your ears to relax to get better hearing enjoyment and protect the ears. 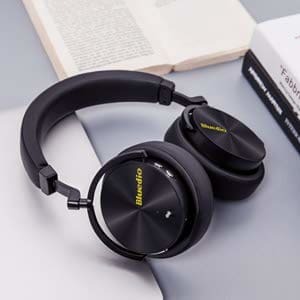 【HANDS-FREE CALL & BUILT-IN MIC】Bludio T5 Bluetooth headset provides a quick and stable connection with your Bluetooth enabled devices like cell phones, tablets, pc, TVs within 33 feet, with a high-quality built-in microphone for hands-free calls. Note: The Microphone only works in the wireless mode. 【Type-C PORT, WIRELESS & WIRED MODE】Three in one interface which supports charging and data transmitting. It can be easily plugged in both sides and convenient to use. 1. 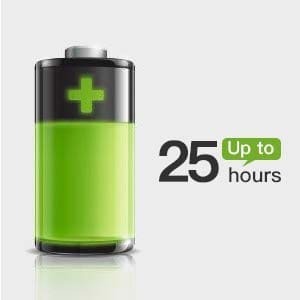 The wireless mode: Battery up to 25-hr music time/ talking time in a single charge; 2. The Wired mode with 3.5mm audio cable: you can also use it as a wired headphone with the provided audio cable so the headphones will never power off.